There is a sense of economic crisis in Britain as the recession looms. Such crisis moments tend to re-mold "common sense" ideas, with many orthodox economic assumptions proving highly vulnerable to revision in the wake of last autumn's financial meltdown. So could Britain's determination to remain outside the eurozone be the next orthodoxy to fail? It was an idea floated in the midst of the financial crisis by Jean-Claude Juncker, the Luxembourg premier and head of the Eurogroup of finance ministers, who was reported as saying that circumstances might prompt Britain to rethink its policy. Commission President Jose Manuel Barroso has since repeated the idea. Looked at in political terms, how likely does this prospect seem? Britain's official reasons for staying out of the eurozone were set down after "New Labour" took office in 1997. 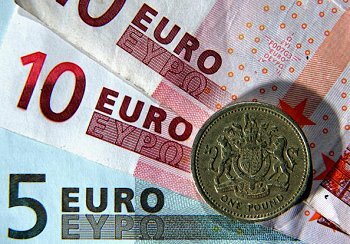 When Chancellor of the Exchequer, or finance minister, the country's current prime minister, Gordon Brown, established five key tests which would have to be met with "clear and unambiguous" evidence before Britain would consider joining the euro. These tests were defined in such a way that the prospect of membership was effectively removed from the short-term political agenda. The policy was often assumed to be more in tune with Brown's euro-skepticism than the ostensibly pro-European views of then-Prime Minister Tony Blair. So when Brown replaced Blair, it hardly seemed likely to herald another euro debate. Yet there are now several reasons why the debate may return to the political agenda. First is the way that the current crisis is redefining prevailing economic attitudes. Confidence in the British economic model has been shattered, along with the grounds for its often lofty disdain towards rival continental models. The financial crisis has provoked heightened levels of interaction between E.U. governments and finance ministries, and while this has not always led to coordination, efforts at international management of the economy have rarely been more visible. The second reason for a possible revival of the euro debate is the electoral timetable. In addition to European Parliamentary elections this year, Britain can expect a general election before mid-2010. If the current difficulties persist, one of these elections may well be fought on economic grounds and at least one political party may try to entwine these issues with those of Britain's relationship with Europe. Third, and more marginally, the departure of the Bush Administration in the United States is likely to change the broader context of Britain's relationship with its E.U. partners. The "special relationship" between London and Washington may endure in one form or another, but it seems more likely to be embedded in a wider framework of multilateral relations. In short, the United Kingdom may be less pressed to choose between an Atlantic and a European orientation. If euro membership were to return to the British political agenda, what would be the likely outcome? It is doubtful that a decision would come before the next general election, so much would depend on which party wins power. The Labor government recently welcomed a high-profile europhile back into the Cabinet — the former European Trade Commissioner Peter Mandelson. Were he to become a minister in a fourth Labor government, there might be some drive to renew Britain's European ties. Conversely, the complexion of the Conservative Party is now more euro-skeptic than for many years. It takes an effort to recall this was the party which took Britain into the European Economic Community under the premiership of Edward Heath, or that Margaret Thatcher agreed to the Single European Act. Still, on the Nixon-to-China principle (that the least likely ally is also the most effective at rapprochement), this leaves the Conservatives well-placed to make a convincing argument in favor of the euro, should they be so inclined. How would such arguments play with the British public? It is an essential question, given that any British move on the euro could well be decided by referendum. And there is every possibility the prospect of euro membership would be perceived as an extension of the economic difficulties rather than an effective counter-measure. One may also wonder just how keen some members of the eurozone might be to welcome an Anglo-Saxon economy into the single currency at a time of trouble. Any British government might conceivably find itself pushing against a firmly closed door. Perhaps this sort of concern provides an imaginative resource for the United Kingdom's europhiles, for there may be few things more likely to raise the indignation of the British tabloid press, and persuade a skeptical population of the importance of the moment, than the insidious notion that "those Europeans are trying to exclude us from the club!" This article was originally published in Europe's World, www.europesworld.org.